Ed Cooley has quite the juggling act on his hands early this season. Unlike in years past, he has 11-12 players capable of giving him minutes, but capability hasn’t equated to consistent production (or defensive awareness) for much of the roster in November. In Tuesday night’s win over Fairleigh Dickinson, Cooley sat veterans Maliek White and Emmitt Holt, and gave extensive playing time to sophomore point guard Makai Ashton-Langford. Notably, Ashton-Langford sat for the entirety of Providence’s previous game — a win against Iona in which White was a bright spot. Translation: if this were Villanova and not FDU we likely see White on the floor following his six point, six assist outing against Iona. Ashton-Langford responded with his strongest effort of the early season, with season highs in points (6), assists (3), steals (2), and blocks (2). 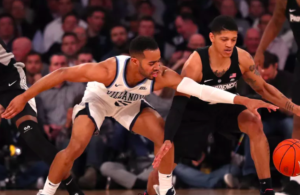 The numbers aren’t eye-popping, but for the first time in 2018-19 we saw Ashton-Langford playing with renewed energy and pace — in a game in which the Friars were dragging early. 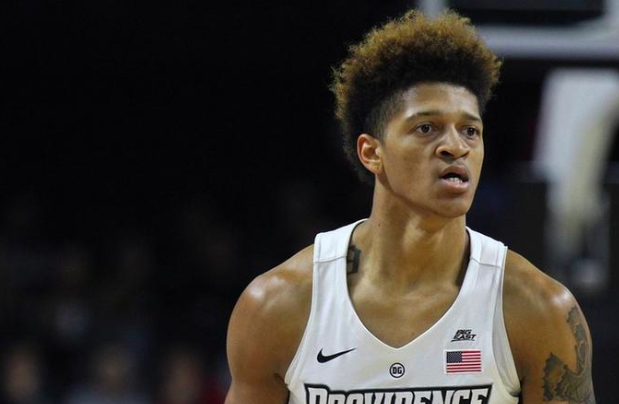 When he entered the game about six minutes in, the Friars led 8-6; as he departed seven minutes later, Providence had pushed its edge to 21-12. “I thought he had a couple of better days in practice. Made a big shot for us, a couple of big layups, big assists, so I was really proud of how he responded to not playing the last game,” Cooley said of Ashton-Langford afterwards. 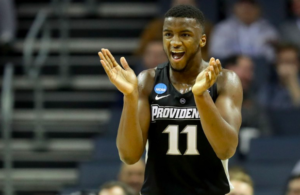 If the pockets of the fanbase on social media are any indicator, Ashton-Langford has seemingly taken the mantle from Jalen Lindsey as the most divisive player on Providence’s roster. Lindsey was a solid player at PC, peaking as a junior after a pair of subpar seasons from beyond the arc to kick off his career. Billed as a 3-D wing, Lindsey seemingly couldn’t shoot straight until his third season in which he hit on 46% from deep (4th best single season 3pt % in school history) while making over 70 3s. He was also a lightning rod. Lindsey was the 32nd rated player in the country per ESPN at the time of his commitment to PC, and to some he developed into a well above average wing defender and good 3-point shooter (nearly 150 3s made over his final two seasons), but others bristled at his lack of handle or willingness to use his athleticism to help on the glass. Perhaps the first truly divisive Friar of the internet era was Marcus Douthit, a highly-touted 6’11 center from Syracuse who committed in the fall of 1999. As a freshman, Douthit capably filled in as a backup center on PC’s surprising 2001 NCAA tournament team. He then inexplicably fell off of a cliff during a sophomore season in which he was expected to seamlessly transition into the starting rotation. Douthit struggled for all of his sophomore campaign and over half of his junior year, before finding his niche as a defensive force in the middle of a 2-3 zone through the final dozen games of his third year. Douthit averaged over three blocks per game in both his junior and senior seasons — one of only three Friars to average three per game over the course of a season. Douthit’s beauty was in the eye of the beholder. For instance, he once came up a block and a turnover shy of an unfathomable points/blocks/turnovers triple double… and he wasn’t handling the ball a ton. If getting buried on the internet was a trackable statistic, Douthit’s name would be featured prominently atop Providence’s media guide — impressive for a pre-Twitter era player. For most of his sophomore season he looked like a lost cause. During his junior year, Douthit shot under 40% from the field, yet he blocked three shots a night in just over 20 minutes. Despite his offensive struggles, Douthit’s return to regular minutes paved the way for PC’s defensive identity change through the 2004 campaign that peaked with a #12 ranking in the AP poll. Before returning to the rotation as a junior many thought Douthit was too much of an offensive liability, no matter what impact he had on the defensive end. He really wasn’t a great defender until PC stopped playing man to man and went to a 2-3 zone extensively. And with that, Douthit’s value sky-rocketed to the point where he was eventually drafted by the Lakers. Was either side absolutely right or wrong in their critique or defense of Lindsey or Douthit? There’s a pattern here: a highly-rated recruit flashes signs early in his freshman year, loses his game, and recovers in time to be a valuable, albeit flawed, piece of a good team. There’s another pattern at play — fans who support said player will look for any inkling of improvement to prop them up, while the heels of the detractors are firmly planted and not budging anytime soon. The debate will be endless. Both sides will be kind of right… and we could be entering that territory with Ashton-Langford. For Ashton-Langford, there will be those waiting for the speed and change of pace ability that made him such a tough cover at Cushing and Brewster Academy. Others see a broken jump shot and uncertainty with the ball in his hands. Currently, on Providence’s Scout message board the most popular threads are on the team’s rotation (3 pages and 58 responses), a Fairleigh Dickinson game thread (3 pages, 74 responses), and Ashton-Langford (10 pages, 251 responses). The only other active thread on an individual player is a five response conversation on Emmitt Holt that ended over a week ago. Similarly, at friartownhoops.proboards.com, there is an 11 page, 150 response string on Ashton-Langford. The Ashton-Langford story has many layers to peel back. He was one of the highest rated recruits to commit to Providence over the past 20 years, he’s part of a crowded point guard rotation with high-upside freshman David Duke and junior Maliek White (a shooter who is very much a different player than Ashton-Langford) — and point guard is where Providence has been so great under Cooley historically, yet so inconsistent this year. Ashton-Langford’s season will be one of the most intriguing subplots of the 2018-19 season. I’ve seen enough of Ashton-Langford to believe that he can be effective at Providence, but he needs to rediscover his confidence to do so. At his best, Ashton-Langford is a daring paint driver (watch the change of speeds against URI), but he has looked tentative since playing with aggression last November. Those who watched him throughout his prep career weren’t surprised to see him attack last November, and are holding out hope that Tuesday night was a step toward the return of that player. His confidence looked to have taken a hit over the past year (especially when compared to the assertive player in the footage above), and that’s why Cooley made the right move in giving him extended minutes Tuesday night. Cooley talks about playing with “pop” and Ashton-Langford provided energy. Cooley may need to mix his point guard rotation depending on matchups, and could also potentially play two of Duke, White, and Ashton-Langford on the floor together. 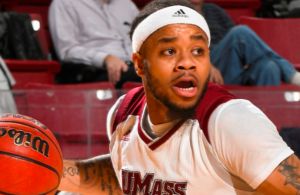 How the point guards develop could well determine where this team ends up in March. After both White and Ashton-Langford were effective their last appearance, there will be a lot of intrigue and conversation the first time Cooley goes to his bench on Saturday night against URI.